As I think I mentioned, I’m giving a talk in Boston on Wednesday at the 4th Clean Energy conference, and so it’s gratifying to have some early interest in the book in Boston nedia. In the Globe, Anthony Doerr pairs Eating the Sun up with The Superorganism, the new ant book by Bert Holldobler and E. O. Wilson (Amazon UK|US) under the headline “Overlooked Agents of Change” and says excitingly complimentary things. On the surface, Morton’s new book is about photosynthesis. But to say this doesn’t do “Eating the Sun” justice. Over the course of the last century, with something like quiet heroism, scientists have dissected photosynthesis, illuminating an exquisite symphony of biochemistry. Morton devotes the first third of “Eating the Sun” to charting the thrills of elucidating that symphony. The intricacies of the chemistry in this section get occasionally confusing, but hang in there. In the latter two sections of the book, Morton starts hitting simpler, more accessible notes, and he hits them beautifully. For all of us who’ve shivered outside on a bitterly cold morning and muttered, “So much for global warming,” “Eating the Sun” helps us understand the immense complexity of what’s really going on. …The infinitesimal chemical reactions occurring inside the leaves in your backyard are ultimately connected to the gasoline in your lawnmower and the air over Kathmandu. And “Eating the Sun” elegantly traces the multiple, increasingly skewed reverberations inside that system. Meanwhile Jim Sullivan at the Phoenix interviewed me about what the conference keynote I’m giving would say. Incidentally, the Phoenix piece also quotes me completely accurately on how easy life has been with fossil fuels, because they are such dense and accessible stores of energy. At the broad historical level this is true — but seeing it on screen suggests to me that it could be read as minimising the hard and frequently deadly work of those who actually mine and have mined the coal, and who drill for oil. Not my intention at all. Despite the urgent need to publicise my appearance at the Brighton Science Festival‘s Big Science Sunday, I wasn’t planning another South Downs conservation post, but synchronicity forced my hand. Shortly before leaving work tonight, I was irritating my colleagues by voicing my probably irrational dislike for programming by David Attenborough. (It has at least vague justifications — I particularly dislike the way that he sees wonder as immanent in nature itself, rather than a creation of the way in which we position ourselves with respect to nature — but this is probably not the place for them, and honesty compels me to admit there may be a bunch of things like grandfather hang-ups at play too). “I greatly applaud the plan to erect a wind turbine. That such a celebrated institution should pay such regard to its environmental responsibilities seemed to me to be wholly admirable, demonstrating that some communities really do take the ecological challenge seriously and do not simply utter pious words and leave it to others to take action. I don’t think one windmill in Sussex makes much of a difference either way — wind’s role in the UK will surely be mainly off shore. And a windmill for an establishment that also maintains a helipad is a trifle absurd. But such things do have symbolic power, especially when coupled with a cultural attraction of such excellence and renown. And the arguments against windfarms — that they damage views that they often enhance, and that they, as interventions that will last a century at most, in some way do lasting damage to landscapes, rather than to the amenity they provide to those in the happy position of inhabiting those landscapes and unwilling to see them change — seem so wrong headed that I find myself broadly in favour of the things on principle. Besides, I like the energy-as-flow symbolism that they embody so gracefully; look at a wind turbine and you know that you’re seeing an open process, not a finite stock, and that’s a good lesson in how we have to understand energy in the decades to come. In the grand-old-man stakes it seems odd to find myself on the same side as Attenborough, whose work I mainly dislike, and the opposite side to Jim Lovelock, whose work I deeply respect. But attitudes to the countryside do funny things to us all. The Observer brings a conservation story that strikes a chord — complaints over the plan to let Cuckmere Haven, on the Sussex coast, flood. This is a national story because pictures of the Seven Sisters from Cuckmere are iconic (see above) and because a landowner who is to be inconvenienced is a major figure in publishing, which is the sort of connection that can help a story. It is a news story thanks to the fact that one of the little cottages overlooking the haven from the west is the setting for some of Atonement, which is probably not going to win many (any?) oscars tonight (my suspicion is that it has no real chance in any big category and that the craft stuff it might win for will mostly be taken by Sweeney Todd, though Keira Knightley’s modelling may secure a win in the costumes category; more in this vein below). The flooding plan would allow the haven to revert to wetlands by ceasing to make efforts to control the ingress of the sea. This will mean that the current rather managed feel of the area will be lost (and that people walking from Eastbourne to Seaford at low tide, as I did a few years ago, will no longer be able to take a short cut by wading across the mouth of the river and so will have to walk a mile or so inland to Exceat and back out, which could, I’ll admit, be a drag). At the same time it will improve the area for wildlife and save a bunch of money. It will also, according to Nigel Newton of Bloomsbury, who owns one of them, endanger the three Atonement-linked coastguard cottages that stand to the west. They are, frankly, not as pretty in real life as they can be made in photos, but if I owned one I’ll admit that the thought of it being undercut by erosion would not be welcome to me. That said: you buy cottages on clifftops with certain risks attached. If there weren’t any erosion going on there wouldn’t be a cliff. And I imagine there is some sort of compensation in place (if there weren’t, surely the article would have mentioned it). And there’s a chance the erosion won’t do the cottages in. More generally, the point of conservation is not — or should not be — simply to keep things as they were. Conservation in the current world must also be about maximising potential and managing change. If one is to take seriously the idea that diminishing wetlands are bad for the environment, then saving money by getting one re-established makes a lot of sense; if we do this sort of thing enough maybe Britain’s overpowerful bird-watcher lobby will be more amenable to seeing sense on matters such as the Severn Barrage. What’s all this got to do with Eating the Sun? 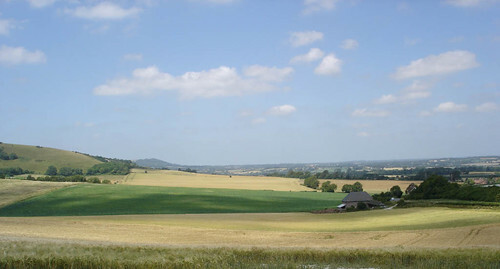 Well the South Downs play a role in the book (at some time I’ll get round to posting the chapter they’re in online as a sample). And I’m getting down that way next week for the Brighton Science Festival’s Big Science Sunday, (where Jim Endersby and Richard Fortey are speaking too, as it happens…). But also just because, the more distant I get from having written Eating the Sun, the clearer its central message is to me: processes trump things. Think of energy in terms of flows, not in terms of stocks of fuel. Think of nature the same way. 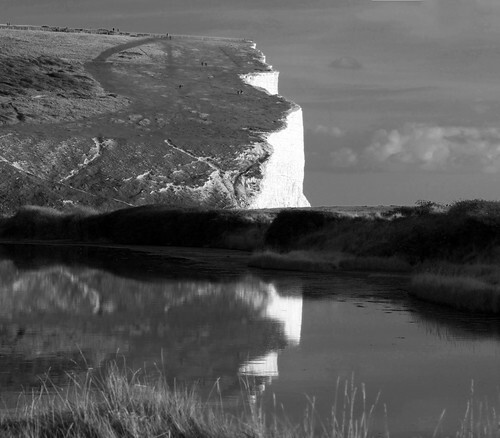 Appreciate places — including peculiarly lovely ones, like Cuckmere — as the intersection of a skein of processes. Expect them to change and appreciate it. Don’t be fatalistic — there’s bad change as well as good. But don’t overvalue the static, even when you love it. I don’t know much about book festivals, but you don’t have to know much to be knocked out by the Edinburgh International Book Festival, which closed on Monday night. I’d been there before a few years ago, for an on-stage interview with Jim Lovelock that was a sold-out success, and this time I was there to plug my own book, Eating the Sun, at two events. But the thing that struck me, both times, was the enthusiasm of both organisers and punters, the stunning number of people and topics that they manage to get into 17 days (700 events, 650 authors, pdf programme) – and the stamina that those 17 days must require. Organiser Catherine Lockerbie, who has that stamina in spades, found time to give the Daily Telegraph a taste of what the weeks are like. Good things: endlessly friendly and helpful staff; generous sponsorship in kind (and doubtless otherwise) from Highland Park, which may not be “the best spirit in the world” (among other things, forget not the Ott) but which is undeniably wonderful; a terrific bookshop; excellent chairs at the events who knew their stuff and worked hard to do their best by the speakers and by the audience; Carol Ann Duffy’s closing poetry recital; my co-presenters Martyn Amos and Nick Harberd; bumping into Ken Macleod (great short story published in Nature|recent Nature feature, both subscribers only); speaking in the Spiegeltent, which had a really great vibe to it – much more Moulin Rouge than the venue for your average talk on “The future of nature”; pretty much everything else. Bad things: not being able to go to all of it; one slightly underlit lectern; err … that’s it. I’ll be participating in two events at the Edinburgh International Book Festival over the bank-holiday weekend. On Sunday evening, 19:30, I will be discussing the future of nature (concept, not magazine) with Martyn Amos, author of Genesis Machines. This is not about Phil Collins’ posthetics, but instead about DNA computing and synthetic biology, on which subjects his “lucid and punchy prose conveys a genuine excitement of the frontier” (Guardian review by Steve Poole). Apparently in this discussion I will be examining the role that plants might play in the future, though I fancy I may stray a bit beyond that brief. I’m enjoying Seed to Seed and wonder whether it should have been one of the Indy’s nature-book picks, but I don’t know what I’d oust to make room for it. Anyway, I look forward to meeting Nick and hearing what he has to say immensely.